Compared to traditional NFS architecture configured for high availability, the solution is most often costly as the need for additional dedicated hardware is necessary. 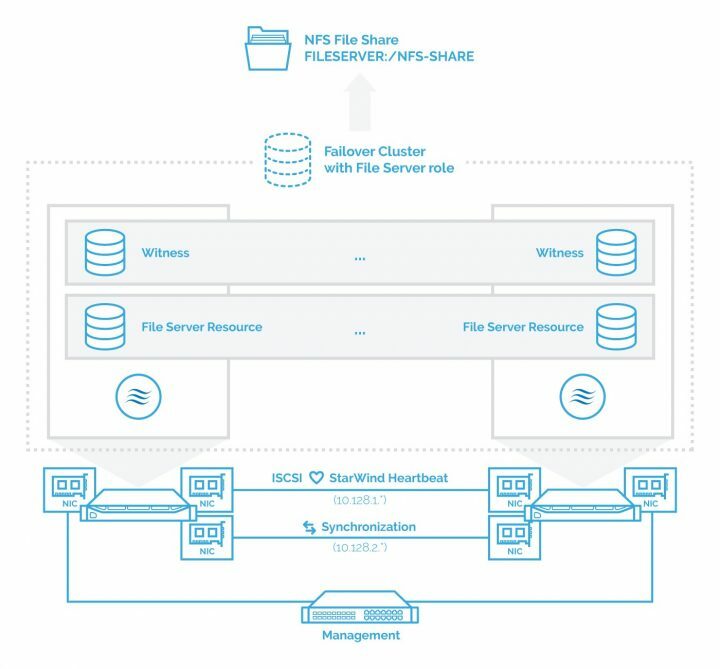 But there are other ways to do that and today we’ll show you how StarWind and Highly Available NFS share is configured and what’s the benefits. You’ll see that a configuration of a two-node fault-tolerant cluster in Windows Server 2016 with StarWind Virtual SAN as a backbone for your HA shared storage. can be done with two servers only. It will allow you to have a continuously available file share(s) available over NFS protocol. StarWind has no specialized hardware requirements and minimal overall requirements. But when deciding on a new architecture, they also have a choice of hardware appliances which is pre-optimized and pre-populated with the best performance hardware and pre-installed with StarWind Software. Advantages of StarWind’s solution are that by using only two-nodes to provide high availability. StarWind synchronization which is asynchronous and which runs continuously, in the background, allows “losing” one node and still be online with your file share. The architecture proposed starts with an installation and configuration of 2 nodes with Windows Server 2016. The underlying sync is configured within StarWind iSCSI as we know. This does not change from other, traditional iSCSI architecture by StarWind. What’s new in here is to use WS 2016 providing the NFS export to the outside world, on the top of StarWind. Install Failover Clustering, Multipath I/O features, and the Hyper-V role on both servers. Configure static networking on both nodes, with an additional NICs which will be used for synchronization channel and StarWind Heartbeats. Via replication manager select Synchronous two-way replication. Launch iSCSI initiator configuration on each WS node and configure target portals and connect targets. Then configure MPIO. Launch failover cluster manager and configure failover cluster. On your WS you can then configure File server role with general use option. This list is only a high-level list. Not a step-by-step. The full configuration with all steps is pretty long and has already been done by StarWind. 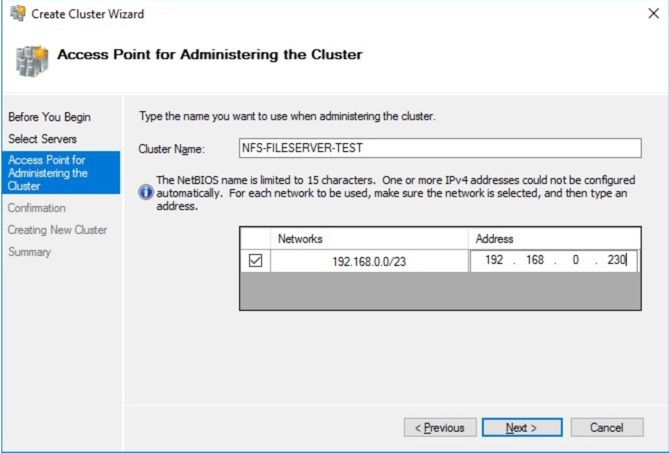 Note: You can find all steps within a detailed Step-by-Step article At StarWind blog here: Configuring HA NFS File Server in Windows Server 2016. StarWind Virtual SAN Free is completely unrestricted: it is allowed for production use, supports all usage scenarios of the commercial version, has a perpetual license, and is not feature- or functionality-limited version of StarWind Virtual SAN.